CJ has been delivering percussion workshops, specialising in West African Drumming, for over 20 years. CJ has spent time in West Africa, to further her knowledge & skills. As well as African drumming, her workshops also include other genres of percussion for example, Samba and Junk. Workshops also include Ukulele and Composition, Singing and Musical Games & Activities. CJ organises her own workshops locally for adults and children, including sessions for children with learning disabilities, as well as delivering them in many schools in the South East (special needs & mainstream), colleges, organisations and clubs. CJ has worked for organisations in the past such as Music For Change, Pie Factory Music, Big Bash Music and Music 4 Wellbeing, where she has delivered workshops and put on shows, performing within the community and local festivals and events. CJ is currently a music practitioner for Music 4 Wellbeing. CJ delivers workshops at many of the festivals, locally and all over the UK. 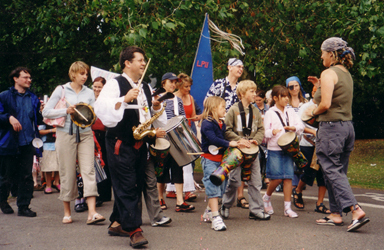 Examples include Broadstairs Folk Week, Sandwich Folk & Ale, Lounge On The Farm and the Green Gathering in Wales. Also see CJ’s Facebook group page “CJ’s Music Workshops“.